Just watched the documentary The Grizzly Man, about Timothy Treadwell, who spent thirteen summers in the Alaskan wilderness living with bears. A lot of people have criticized him for how he interacted with the bears, getting quite close, sometimes even touching them. When he wasn't in the wilderness, he gave talks about bears, trying to spread understanding of the creatures. 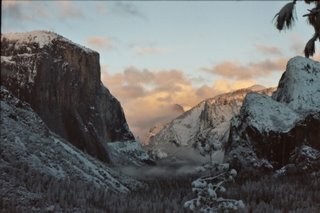 He did this for free, sharing his amazing footage that he took in the backcountry. Treadwell was eventually killed by a bear, along with his girlfriend, Amy Huguenard. They were attacked while in their tent, the kind of attack that almost always is predacious on the part of a bear. It was very late season, during the fall, when bears are hyperphagic, eating everything they possibly can to bulk up for the winter's hibernation. Many of the bears Timothy considered his friends had begun hibernating, and his usual spot was filled with bears he was not familiar with. I think a real part of this tragedy is that the bear who ate him was killed, something Timothy would not have wanted. He longed to spend his days in the wilderness, just as the backcountry ranger of my last blog did. As did Muir, as did Thoreau. Humans are separated from nature, especially in industrialized countries. Many of us do not know that unique and wondrous sensation of being in the wilderness, where we are a part of everything else. We're missing that entirely in the cities and suburbs. We have this illusion of being the masters of our domain. If it's raining, we go inside. If it's cold, we turn on the heat. We don't have natural predators in the city because we've killed them all off. And with this safety and control over our environment, we're missing something we once had. We're missing wildness, being part of something so much grander than ourselves. We're missing towering mountains and thundering waterfalls. We're missing the crisp, clean high altitude air and the unrushed, uncomplicated natural world. And yes, we're missing the bears. Some of us seem to feel this separation from nature, this loss, more keenly than others. People like Alex McCandless, the hiker who walked into the Alaskan backcountry and did not return, people like Timothy Treadwell, who felt compelled by nature, enchanted by it. They were most happy when out in it, when being a part of it. Many of us feel a hole in our lives, a loss which we cannot quite find the reason for. I think for people like Treadwell and McCandless, this was healed by nature, for nature itself -- wildness -- is what is missing. For those who have never ventured into wilderness, it is easy to imagine it a cold, unfriendly, uninviting place, and to not understand what Thoreau, Muir, or Treadwell saw in it, why they returned year after year and wrote about it so eloquently and so full of passion and heart. But once you have been out there, felt everything come together inside yourself, felt a part of it all, it is so clear and easy to see why it is utterly enchanting. Protecting such places is vital. We need our wild places. We need the bears, the salmon, the foxes, the wolverines, for without them, true wildness is lost, and we will never get it back. I just finished reading The Last Season by Eric Blehm, about a backcountry ranger in King's Canyon National Park who disappeared mysteriously in 1996 while in the wilderness there. Delivering a gripping read, the author not only decribes the search for the ranger, but the ranger's life and situation leading up to his disappearance. But what struck me most about the book was the resounding feeling of longing for the mountains on behalf of the ranger, something I strongly relate to. I've spent much time in the mountains, and I, too, feel their call, feel them pulling at me when I am away. I long to wander in rugged, alpine terrain, to gaze at meadows strewn with vivid purple and red wildflowers, to see the tumbled forms of rockslides and talus slopes, and the deep blue of mountain lakes nestled in bowls and cirques. My parents took me to the Canadian Rockies when I was four, and I was immediately hooked. Those mountains answered some call inside me, some longing. Hiking into the high country, with steep granite falling away beside me, the sweep of emerald moss beneath tumbling waterfalls roaring away from snowmelt, crossing snowfields and listening for pika in talus slopes, is something incomparable to everything else I've experienced. I've felt kinship with other writers captivated by wilderness -- John Muir, Henry Thoreau, and now the vanished backcountry ranger. 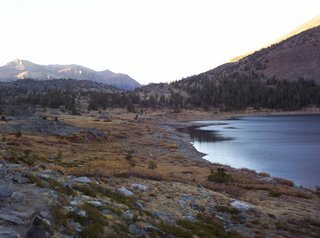 I can vividly imagine what it was like for him, twenty eight seasons in the backcountry of the Sierra Nevadas, an enchanted place Muir described as the Range of Light. Just spent the last four days at Disneyland. I had a fantastic time, and the park was decorated for my favorite holiday -- Halloween! Everywhere jack-o-lanterns glowed in windows. During the nightly fireworks show, ghosts raced up the side of the Matterhorn. We rode just about every ride in the park, from the thrilling, fast-paced jeep ride through snake-infested temples on the Indiana Jones ride, to the newly revamped Pirates of the Caribbean ride in which Jack Sparrow now appears. Perhaps my favorite was the Haunted Mansion redone as the Nightmare Before Christmas. Zero floated hauntingly in the corridors and ballroom. Disneyland really is more than a theme park, at least how I think of theme parks. It's not just rides, it's music and dancing and stunning shows. We caught the Fantasmic show on Saturday night, where they project animation onto misting walls of water and work in fire and fireworks. It's really incredible. We also rode the thrilling Twilight Zone Tower of Terror ride, which resides in a spooky, run down-looking hotel decorated for a Halloween night in 1939. After listening to Rod Serling describe the terrible events that befell the hotel, a bellhop ushers you into an elevator that drops you straight down, then rises again, the doors opening to reveal a vista of the park and hills around you before dropping you once again. It was quite a spooky visit!